Hollendingar eru duglegir að nýta reiðhjól til að komast á milli staða en stundum þarf að fara með heilan hóp af krökkum milli skóla og frístundaheimilis og hvað er þá til ráða. Í Hollandi eru nú 25 skólahjólarútur notaðar í einmitt þessum tilgangi. Átta krakkar á aldrinum 4-12 ára drífa farartækið áfram ásamt fullorðnum rútustjóra og pláss er fyrir þrjá farþega til viðbótar. 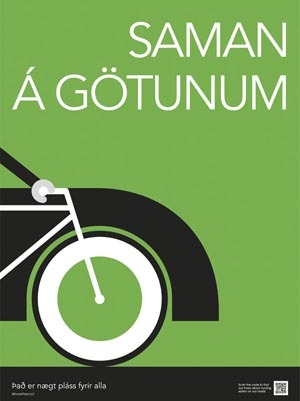 Þetta er góð leið til að leyfa börnunum að fá smá hreyfingu og stunda útivist. Ef illa viðrar er hægt að setja upp hlíf og innbyggður hjálparmótor hjálpar ef erfiðar brekkur mæta farartækinu. For all the things the Dutch are known for, being bicycle fanatics is definitely one of them, so it should come as no surprise that there is now an invention that introduces children to the world of bicycles in the form of a... buscycle. The buscycle works pretty much like a tandem, and allows for 8 children aged 4-12 to pedal, one adult buscycle driver, and room for 3 freeloaders. It's got some nice guards on the sides for added protection, especially for the younger children and comes in, of course, school bus yellow. While the power of 9 people pedaling furiously can overcome most obstacles, there is a small built-in engine that can be turned on to help out for those especially difficult hills. On top of that, the bus features a built-in sound system and an awning to protect the passengers on those rainy days. The bus is currently being used to transport children from their schools to after school care. The ingenious buscycle is built by Tolkamp Metaalspecials and sold by De Cafe Racer. While there are currently only 25 that are in use, Tolkamp hopes to export more to other countries. Currently, the going price for one of these contraptions is around $15,000. While this means of transport might not be the most sensible in every country around the world, it certainly is an environmentally friendly way to get children outside and exercising! Tolkamp isn't the only one who has come up with this idea. There are several other varieties out there for people to peruse. There's the actual Buscycle, a 15-person pedal-powered bus. Unlike the Dutch counterpart, this vehicle has the people facing outwards and does not have a just-in-case engine. Another pedal-powered bus is the Human Powered (HP) Bus, designed and created in the Netherlands. This bus is even larger and fits 32 people and, of course, a driver. While there are other people who have similar ideas, Tolkamp was able to produce these pedal-powered vehicles for consumers. Although they have only sold 25 to date, it is far and above the most popular vehicle of its kind... aside from an actual bike of course.